Props to Mike Stys, Luke Bonner and the rest of the gang who put on the Sam Carey Classic to include a girls all-star game in the event for the first time in 2016. 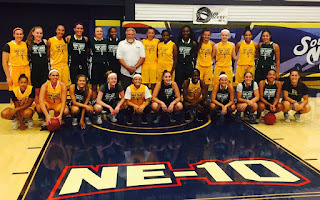 Of the event's three games that were played on Friday night, the girls all-star game was the most competitive game from start to finish - and had more passing! One team consisted entirely of local NH prospects, while their opponent was all players from out of state (mostly Massachusetts). The NH Team made an impressive 2nd half rally, but fell short in a thriller, 59-57. The NH Team trailed by as many as 16, 55-39 with 7:20 left in the 2nd half. It looked like the game was all over at that point. Give the NH Team credit for battling back, as they went on a 14-2 run, cutting the lead to 57-55. The comeback was led by seniors Abby Streeter (Nashua, NH) of Lawrence Academy, Rebecca Ripley (Stratham, NH) from New Hampton School and junior Eva Hodgson (Rindge, NH) also from New Hampton School. Streeter is committed to Rhode Island, Ripley is committed to Miami and Hodgson holds 9 D-I scholarship offers. It was a well balanced scoring effort for Team NH. 11 of their 12 players got in the scoring column, and the one player who didn't (Nicolette Arnold of Derry, NH) made an outstanding pass from 3/4 court right on the money to teammate Ashley Berube (Londonderry, NH) for an and-1 finish. Arnold picked up 4 scholarship offers this summer. Leading the way was Streeter and Hodgson with 9 points, while Ripley tallied 8 and Berube chipped in with 7. Proctor Academy 5-foot-7 senior point guard Amanda Torres (Hudson, NH) knifed her way to the rim for a finish in traffic early on. Bedford High 6-foot senior forward Jenoyce Laniyan made a strong take and finish for an and-1 in transition. Tilton School 5-foot-11 senior Mayson Kimball (Penacook, NH) buried a 3-pointer off the catch, using a high release. Arnold threaded the needle to Berube, Ripley spun into the lane before hitting a leaner and Bradford Christian Academy junior Heather Durand drilled a 3 off the catch from the wing. Durand played solid and has clearly been working on her game this summer. The non-NH Team was really good, though. It sure seemed like they were a team that had played together before. While the NH team was a little out of sync on offense and was having passes get deflected or stolen away, the non-NH Team was more sound. The NH Team also had a couple of defensive lapses which led to easy baskets for the opposition. Still, the NH Team battled hard and nearly pulled out the win against a very good team. Torres used a quick first step to blow by her defender, got to the rim and got fouled. Bradford Christian Academy guard Sydney Richard (Hooksett, NH) hit a jumper from the outside. It was 31-24 non-NH Team at half. In the 2nd half Hodgson drained a 3 and Berube hit a jumper from the foul line as the pace of the game picked up even more. We now had some up-tempo action with a nice flow to the game and kids hitting shots all over the place. It looked a lot more like a college game than an exhibition game in the middle of August. Durand made a nice steal, took it to the rim, teammate Chyna Bullen (Exeter, NH) cleaned up the miss and converted the put-back. Hodgson drove it strong to the rim and made a tough finish through contact. Hodgson holds offers from Brown, Pennsylvania, William & Mary, Lafayette, New Hampshire, Fordham, Davidson and Holy Cross. Torres blew by her defender again for 2 more. But then the non-NH Team lead grew to 55-39 with 7:20 left. Streeter contributed to the comeback, hitting a pull-up jumper from 15-feet. Durand connected on a step-back 18-footer. Laniyan converted a put-back. Proctor Academy 6-foot-1 forward Angie Ngalakulondi (Manchester, NH) made a nice block on 'D' and a put-back on offense. Ripley hit a turnaround bank shot, followed by Streeter who drove and banked in a runner. That cut the lead to 57-55. The non-NH team hung on from there for the win. A great game. High level basketball. One of the best girls basketball games I've seen in a long time. A ton of talent on both teams. A higher percentage of NH's top basketball prospects are in prep school than ever before. "It's better competition - like playing AAU all year round" said Hodgson, who plays for the NE Crusaders.